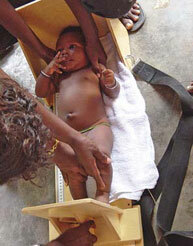 In Ghana, Grace Marquis is exploring the relationship between infant health, HIV-positive mothers and breast milk. And it’s not what you think. When one thinks about infant mortality due to malnutrition, chances are good that archetypal media image of famine spring to mind: the pictures of children bereft of fat or muscle, the proverbial collection of “skin and bones.” But, according to Grace Marquis, associate professor in the School of Dietetics and Nutrition and the Centre for Indigenous Peoples’ Nutrition and Environment (CINE), such extreme cases actually account for only 17 per cent of child malnutrition deaths in developing countries. It’s mild to moderate malnutrition, she’s learned, that kills more kids. “You look at these children and think they’re perfectly fine,” she says. “For many, their weight may be low but, because they also are stunted—they have a low height for their age—the malnutrition is not so obvious.” This is not the only surprising revelation stemming from Marquis’ current work in Ghana. Marquis is collaborating with researchers from the University of Ghana, Iowa State University and the University of Connecticut to study how the HIV status of mothers in eastern Ghana can affect the diet and care of their children. The $1.5-million, five-year Research to Improve Infant Nutrition and Growth (RIING) project is part of a U.S. National Institutes of Health campaign to strengthen the research capacity of sub-Saharan institutions. The RIING team’s findings may eventually save lives and promote healthier childhoods for millions. The stigma attached to HIV is strong in Ghana. Although there is generally a good understanding about true transmission routes (sexual behaviour, needle sharing, mother-to-child), there remain misconceptions that HIV can be spread through direct contact; religious beliefs, gender biases and notions equating HIV with infidelity also contribute to the confusion. As a result, HIV-positive women risk being kicked out of their houses by their partners or family, losing access to secure living quarters and food for themselves and their children. Researcher-subject confidentially is therefore crucial. The RIING staff stress that the study is related to child growth and health; HIV is never publicly mentioned, and only the field supervisor knows the participants’ health status. RIING field workers, all women mostly from the region (and fluent in at least one of Manya Krobo’s nine official languages and numerous dialects), visit the households twice weekly to collect information on the health of both mother and child. Once a month they gauge how well the children are growing by measuring weights and heights, and the circumferences of their heads, arms and chests. The team also carefully monitors each child’s diet, tracking daily nutrition and noting whether the child is breastfed or has received water, dairy products or other foods. Every three months, the researchers conduct a 24-hour monitoring of dietary intake, which includes weighing the breastfed child before and after feedings to measure the intake of milk. 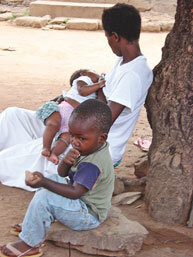 Breastfeeding is of particular importance to the researchers. The World Health Organization has recommended that if HIV-positive women do not have access to safe water and can’t afford adequate formula, they should practise exclusive breastfeeding—no water or food other than breast milk—for a full six months. The WHO’s advice may seem to be counterintuitive, notes Marquis, but is medically sound. “You would think less breast milk from an HIV-infected mother would be better,” she says, “but when you exclusively breastfeed, your child has a healthy gut. When you introduce non-breast-milk foods to young children before the age of six months, you increase the risk of damage to the gut mucosa [the inner lining of the gastrointestinal tract], so the children are more susceptible to infection.” The child’s risk of HIV infection therefore actually decreases when the child is exclusively breastfed by an HIV-positive mother. Further, when this breastfeeding is combined with the drug neveripine during childbirth, and a postpartum regimen of anti-retroviral drugs, the risk of mother-to-child transmission of HIV can be reduced dramatically. 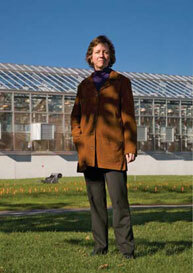 Grace Marquis is the Canada Research Chair in Social and Environmental Aspects of Nutrition. The RIING Project is funded by the U.S. National Institutes of Health.